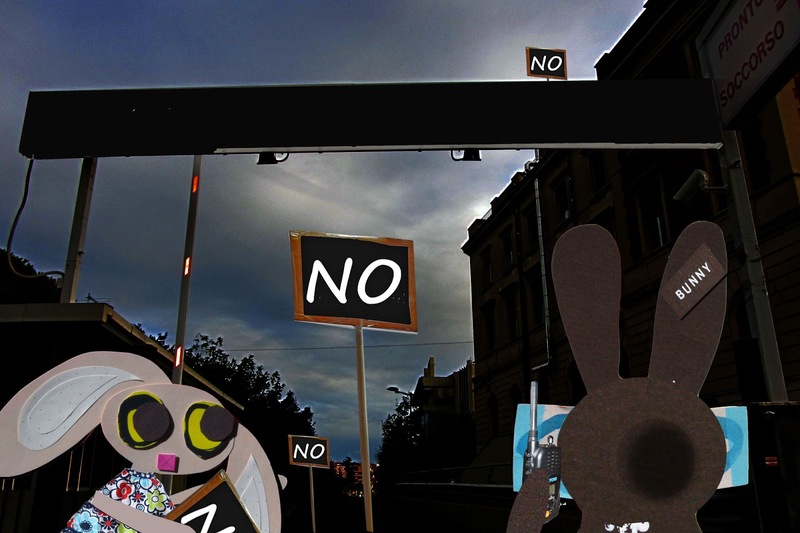 The Wabbit and Lapinette scouted the city for any sign of trouble and trouble didn't take long to find. "What's this?" asked Lapinette. "I don't rightly know, ma'am," drawled the Wabbit. He lifted his radio. "This is Whiskey Alfa Bravo. Come in." The radio crackled for a while, then whined. "Copy," said Fitzy. "You got any Nos?" said the Wabbit. Reception was poor. "No," said Fitzy; "Only a couple of Nots." "What are they doing?" hissed Lapinette. "Nothing," said Fitzy. "Stand by," said the Wabbit. He shut the radio down, cupped his paws round his mouth and yelled. "Who goes there?" Silence. He tried again. This time a low voice answered. "No-one." The Wabbit bared his 28 teeth and stared into the darkness. "What do you want?" A long pause ensued, broken by a small sigh. "Nothing," The Wabbit shrugged. "When do you want it?" "Never," said the voice. Lapinette leaned across to the Wabbit and whispered. "That's metaphysics." Now the Wabbit was deep in thought. He recalled arguments in his philosophy class about whether the class was there at all - and he smiled. Then he turned and shouted. "You can't have a blanket No. It's an abstraction." The Wabbit expected no reply, and that's what he got. He kicked a fallen placard. Lapinette stooped to pick it up, but the placard wriggled and twisted in her paw. "Put me down," said a voice. "No," said Lapinette.